Is elBulli a work of art? Time made Adrià a creator of concepts. He often said: “Being the first is not what’s important. What’s important is conceptualising”. In fact, that’s what happened with elBulli. That temple is gone, but the concept remains. And it left behind a trail which could well be compared to artistic movements. Ferran investigates Ferran The 52-year-old, often hailed as the world’s best chef, is looking to the past in search of the man who, at 25 years of age, abandoned the nouvelle cuisine cookbook and started to explore the confines of the kitchen. The events of time are being compiled into one space, and along the way have become the story of elBulli and what it meant for the history of gastronomy. The story will unfold between 29 October and 1 March in the almost 1000 m2 of the Espacio Fundación Telefónica in Madrid. That will be the first stop. A few months later, ‘Ferran Adrià. Auditing the creative process’ will be exhibited around the world. The chef of today, who has become a globally acclaimed brand, looks back on the youth who devoured cookery books and who took so much inspiration from this quote from Jaques Maximin: “Creating is not copying.” Adrià devoted a space and a time to learning. That space is the restaurant and that time is 30 years. Now they are processing it all. They are doing so from a new temple: the elBulli Foundation. It is a place where they examine the past and aim to invent the future. Ferran wants to learn from Ferran. The restaurant which made him famous, elBulli, transformed gastronomy, and along the way left many lessons to be learnt. But it could be the case that his teachings are not limited to the walls of a kitchen and could be applied to other industries, professions, and disciplines. This is the research derived from research. The first piece of research aims to find out what elBulli’s creative processes were and how they elevated the act of eating into something sublime. This research will be carried out by elBulliFoundation and Fundación Telefónica. The second piece of research aims to find out if the model that was able to transform one discipline could be applied to others, a task which will be carried out by a team of three people cooperating in a project called The Table. This ephemeral agency is made up of two publicists, Jorge Martínez and Toni Segarra, and a mathematician, Enrique Gracián. Since March they have been investigating whether the elBulli working model could be adapted to an advertising agency, allowing advertising to escape from a present that is trapped between the past and the future. Somewhere between the smell of mothballs and the new, more profitable way of doing things. It all began around a wooden table in an inner courtyard of the elBulli Foundation. Here is where the first questions were asked. The Table started to immerse itself in the depths of elBulli. They wanted to discover what they did in that workshop which was so different to what everybody else was doing, because that was what made them stand out from the rest. From there will come the proposal for a new agency model which aspires to overhaul advertising in the same way that Adrià revolutionised cooking. Seven months have passed and the scene is repeating itself. We are in another courtyard, around another wooden table. The Table aims to create a new type of agency based on what elBulli taught us. The full details will be released in November but now, at this table, the biggest questions will be turned into a series of answers. Let’s get started. Adrià would never say it, but The Table would. The chef is an artist. Behind all those years of work lies an artistic impulse, a devotion to cooking as an artistic language, an undeniable poetic desire. That’s how he invented foam and made olive oil into an unprecedented sensation. And when he finally discovered foam, he wanted more. He wanted to create smoke foam. And that is when a dish becomes poetry. Cookery dissipates and becomes art. The artist Richard Hamilton found that poetry in his dishes. The artist knew the restaurant at Cala Montjoi well. He visited every summer and one day started to analyse that ‘lyrical quality’ which Adrià brought to everything he did. The Englishman thought that all of the food at elBulli resembled literature. It wasn’t a question of selecting the best ingredients. Nor was it a case of cooking them to perfection. It wasn’t even about the unique way in which they were prepared and presented. Adrià’s greatness lay in his attempt to refine the language constructed by the food we eat. The Table, as Hamilton did, places Adrià in the art world, but leaves a door open. This affirmation, if applied to mathematical language, would never be a theorem (those indestructible truths that can never be dismantled). They leave it as conjecture, meaning that it can be taken apart. But let’s look at the reasons which make Adrià an artist. Perhaps he himself declared himself as such, without being aware of it, when they invited him to the Documenta contemporary art contest in Kassel, Germany in 2007. The chef decided that he wouldn’t bring anything to exhibit because the only thing he had to show was what he did each day at elBulli. The piece consisted of setting up a table for two in his restaurant, and inviting two assistants from Documenta to eat there every day. 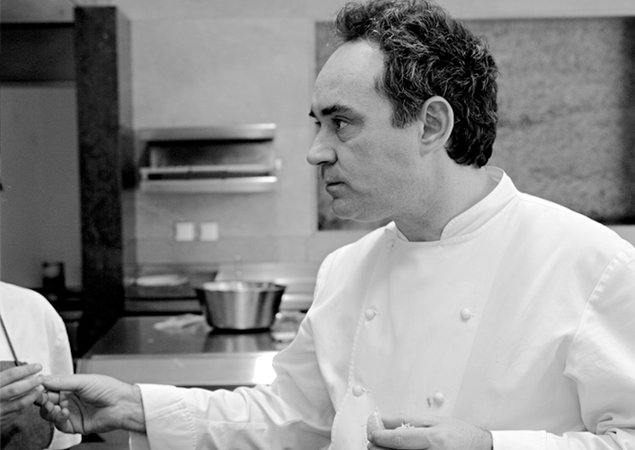 Adrià’s story is the story of a constant search for liberty. Of that freedom which art enjoys. Creating for the sake of creating. Of works of art which do not depend on the market, managers or clients. Ferran started to break down the barriers which limit a restaurant’s activity until in the end, he got rid of the business and ended up with a concert hall. He forgot about money, silenced diners, conquered time and got rid of the restaurant. Let’s take a closer look at the story of this annihilation. One. Money. Money never got in the way. The team knew that they had to follow a way of life which would not interfere in what they wanted to do. Funds had to come from other activities. This provided them with money to put food on the table and give them freedom to create. Juli Soler, the third member, together with Ferran and Albert Adrià, said in the early days of the restaurant: “elBulli does more than just provide food”. Ferran confirmed that thirty years later: “Avant-garde is not business”. And Andoni Aduriz, one of his most faithful disciples, confirmed it: “It never occurred to anyone that they could put the needs of the business ahead of those of the project”. Money problems didn’t matter. They had the mental fortitude to lead a frugal life dedicated to studying and creating. Until it reaped the fruits of its labour, elBulli became the showcase, the hook which attracted business. Funds from business consultancy allowed the restaurant to become a laboratory, a temple for creation and a ground for the creation of great works. Where creativity never depended on money. A principle which, in theory, art also subscribes to. Two. The diner. In a working restaurant everything revolves around the customer. The menu and the service aim to please. At elBulli the diner lost this role and became part of the proceedings. That’s what Ferran’s team calls it. They stop being a customer. And become a spectator. The clientèle becomes an audience who admire his work, which, as Vicent Noce says, means that it is the first time in history that cooking moved away from physical pleasure and towards intellectual pleasure. Three. Time. Ferran’s team shut themselves away for six months a year to prepare next season’s performance. At first they did it because the restaurant was empty. Then they discovered that that was the only way they were able to invent. That retreat from everyday activity allowed them to produce a new mise-en-scène each season with new chefs, new dishes and even new tableware. A restaurant would never do that. A theatre company would. Four. Breaking the conventional restaurant model. A business based on the repetition of dishes morphs into an obsession for never doing the same thing twice. Ferran published his recipes each season, obliging himself to change the menu. Routine suffocated him. He says it extinguishes imagination. That’s why elBulli forewent the traditional menu and adopted the tasting menu. The diner didn’t choose what to eat. The chefs decided. The diner sat at the table in the same way as someone sitting in the stalls of a theatre, waiting for the show to begin. Nobody came because they liked the menu. No-one knew the menu. elBulli was a sort of spectacle where the food aimed to surprise. 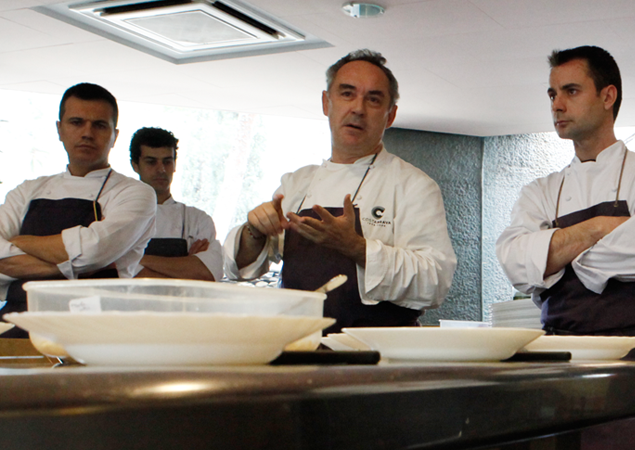 Ferran and Albert Adrià led the show’s design. In the concert hall was Juli Soler, the partner who never doubted investing in a project with no profits, and who made the restaurant into a grand theatre where the presentation of each dish was part of the show. This switch from winning over stomachs to winning over minds was a risk for Adrià and he knew it. The chef knew that not everyone could understand and appreciate his work fully. He didn’t pander to the rich or aim his work towards the most far-flung fringes of society. He looked for those capable of admiring his work and being excited by it. Ferran wanted to elevate a basic activity like eating to an intellectual and sensory level. This is where, again, gastronomy becomes art. 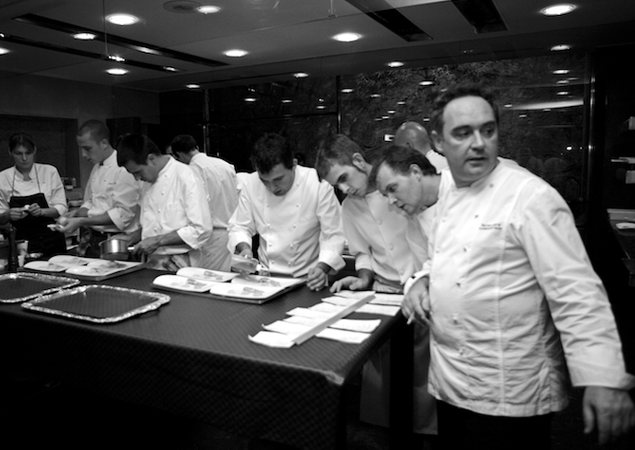 Adrià created a style of gastronomy. A way of seeing cooking as more of a spectacle than a business. He was followed by Andoni Aduriz, Joan Roca, and René Redzepi, among others, but none of them have surpassed the maestro or have been able to move away from his way of doing things. At this wooden table, Adrià is in artist mode. But the debate isn’t over. Ferran is successful in many fields and doesn’t fit the stereotype of an artist. He doesn’t shut himself away in a studio to create. He prefers to set up a workshop and work with a team which acts a think tank. It’s a layout which is reminiscent of the sacred caste which the craftsmen of Ancient Egypt belonged to. In those times, to build a pyramid, a group of the best artists and craftsmen were assembled and then shut away in a compound that few people had access to. That’s where they created the objects which would accompany the Pharaoh in his tomb, for the long journey towards the afterlife. It was a mystical and sacred mission which was led by a member of the priestly caste. In the elBulli workshop they played around with different disciplines, always with the aim of finding new ways of doing things. Just like the Renaissance. Uniting craftsmanship, art, and technology. Yes, technology too. That doesn’t take it away from being art. On the contrary. There is no work of art without research behind it, or the intention of challenging established limits. Wasn’t Leonardo da Vinci an artist first and foremost? Ferran often dwells on technology. He prizes technology more than the final result. He refers to himself as an innovator, seeking his place among those who overhaul a business. But The Table sees this as staying on the palette and not making it onto the painting. As though today Andy Warhol were remembered for introducing fluorescent paint to art, rather than for being one of the founders of pop art. Adrià, in his exhibition ‘Auditing the creative process’, scrutinises the Adrià who created elBulli, in order to learn from him. Or even to construct a character which he would like to see today: a man who shook up the ideas of creativity and innovation in the culinary world. He doesn’t want to hear or speak about the artist who introduced gastronomy to the freedom which is art. The chef doesn’t want it for the past; curiously, he wants it for the future. For a long time, he has been saying that elBulli’s new influence would be art, and as such, he has plans to study Picasso, Duchamp, and other artists in-depth. It might be that he has already learnt more than he is aware of. Ferran is looking for Ferran’s alter ego.